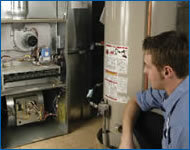 No matter what the age of your furnace, you can improve energy efficiency by keeping it in good working order. With a few simple furnace maintenance tasks, you can ensure peak performance, reduce service calls, and prolong the life of the furnace. If you are replacing your furnace, it is crucial step that air ducts be cleaned prior to the installation of the new furnace. If the furnace is to be replaced and the ductwork is to remain in place it should be noted that the process of disconnecting the old furnace from the duct work and reconnecting the new furnace will disrupt and loosen dust settled in the ducts. Since there can be an appreciable amount of surface area inside the ductwork, considerable amounts of dust is accumulated. The new furnace that you install will probably have more power and a higher velocity fan than the old one. Cleaning the air ducts prior to installation will prevent the dust in the ducts is being blown into your living spaces.